← Have You Included a Tactical Laser in Your Preps? NOTE: The original founder of Preparedness Advice, Howard Godfrey, is the author of this book. I give it my full recommendation as an outstanding source of advice that covers a wide expanse of survival topics. It has been a while since I have written a new post, since I have been enjoying a bit of time off, as well as working on new projects. One thing that I am very pleased with is that Noah has taken good care of this blog. Information continues to be widely shared and you are getting to see some different points of view. 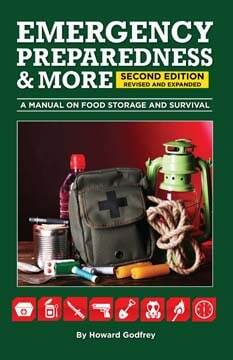 I have been working on revising and updating the second edition of my book, “Emergency Preparedness and More, A Manual on Food Storage and Survival“. I’m happy to announce that it is now available on Amazon. How do you cook your food without electricity? What type of medical supplies should you have on hand? Do you know how to purify your drinking water if the water system fails? How should you navigate precious metal trading? All of this and more is included in this easy to read book. You will see occasional posts from me on this blog in the future. In the mean time, I wish you all well and may God Bless you. This entry was posted in books and tagged books, Emergency Preparedness and More. Bookmark the permalink. I just received my copy and found Howard’s recent revisions and updates quite timely. Chock full of useful and practical hints and tips without the conspiracies, tinfoil hat instructions and gloom and doom common in too much of the prepper literature out there. A message of common sense and self reliance which instills confidence and hope. Lots can be applied to our daily living, and should be, but if hard times are in our future, a source of solid, basic information for the new prepper, and a refresher for those more experienced is a great thing to have. I suggest multiple copies of these as Christmas gifts and to stash in your Get Home Bag or Road Warrior Ruck. I agree! The book is practical and adding dozens of photos is a huge help.